September 1985: Commissioned as an intelligence officer. September 1990: Served in Desert Storm for 12 months. February 2001: Deployed Secret IP Router Network for the Navy Reserve Forces Command in New Orleans. After Sept. 11, 2001: Worked on other critical projects, including creating a continuity-of-operations plan for the command. Sam Sumwalt will answer reader questions on continuity of operations and disaster recovery during an online forum Tuesday, July 10, from 1 p.m. to 2 p.m. EDT. Capt. Sam Sumwalt didn't predict Hurricane Katrina, but he did anticipate it. Several years before the devastating storm struck the Gulf Coast, Sumwalt took Federal Preparedness Circular 65 to heart and established a continuity-of-operations plan for the Navy Reserve Forces Command in New Orleans. As the command's chief technology officer and deputy chief of staff for information technology, he developed long-term plans to ensure that the command's critical applications would keep running in an emergency. Seventy-two hours before Katrina hit, Sumwalt directed the switch of applications to a secondary production site without any downtime or loss of data. The process may have gone smoothly, but developing the COOP plan wasn't so easy. 'We knew the COOP was going to cost money and that we'd just need to bite the bullet,' Sumwalt said. His approach was to prioritize the applications and data that would require relocation during a crisis situation. With the main concerns identified and ranked, he found the resources to establish a secondary production site in Fort Worth, Texas. The COOP plan expanded to include all critical applications and data. The Navy Reserve's IT applications are essential for U.S. warfighting. They support medical readiness, mobilization, fleet operations and individual pay. All aspects of the Navy Reserve depend on those applications. 'Capt. Sumwalt showed considerable foresight in facing what seemed to be insurmountable challenges,' said Capt. Douglas Swanson, chief information officer of the Navy Reserve Force. Sumwalt's team began working on a plan in April 2002, and they had successfully moved all data by July 2002. They tested the transition process by conducting four quarterly tests to ensure total connectivity and data integrity. Each test helped identify opportunities to improve the disaster recovery plan. By the time Katrina hit in the summer of 2005, they were ready. A resident of the New Orleans area, Sumwalt rode out the devastating hurricane at his home, directing the complex cutover by cell phone. 'The site is set up to run remotely, without personnel on site,' Sumwalt said. When five trees crashed into his house, he was forced to evacuate. Systems Center ' and his own house. Sumwalt knows how to make sure that what must happen does happen. 'It has to come from the top; leadership needs to buy into the plan,' he said. Leaders need to pay attention to what the real mission is and how important that mission is. He's taken that approach to other difficult projects. 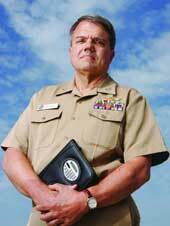 For example, he established the Secret IP Router Network for the reserve command in New Orleans. Creating that component required physical security verification, security training and validation, database management, account management, and security certification and accreditation. When asked about personal role models, Sumwalt named Vince Lombardi. That's not surprising for a Green Bay Packers fan who grew up in Wisconsin, but his admiration goes deeper than an enviable winning record. 'Members of Lombardi's teams achieved great success in their lives after the Packers,' Sumwalt said, adding that Lombardi took talented people and showed them how to succeed throughout their lives. Sumwalt supports his employees by providing training opportunities, and encouraging personal and professional growth. 'When people get the support and training they deserve, they believe in themselves and become better contributors to the organization,' he said. His own impact continues. He recently found the funds to issue Common Access Card readers to all Navy reservists eligible for the cards. This gives a multitude of users secure public-key infrastructure-based access to personal computers for e-mail and other applications on Navy and Defense Department networks. Sumwalt sees significant changes ahead. 'We need new IT initiatives to support new kinds of warfighting strategies,' he said. He hosts an annual conference for Navy Reserve IT personnel to share concerns, needs and lessons learned. It is part of his efforts to inspire his workers and give them the tools they need to succeed, despite diminishing budgets. The same tenacity that beat a hurricane will continue to prevail.